Raises toilet seat 5(1/2)". 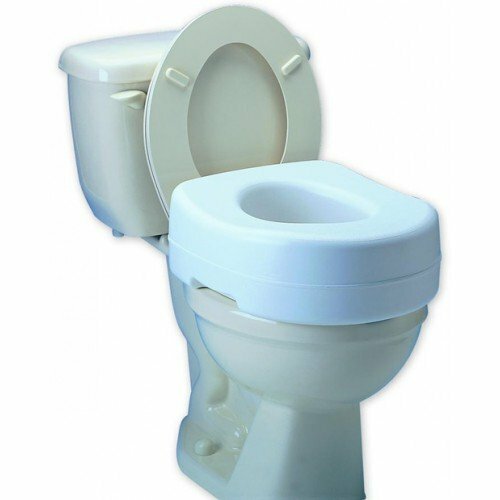 Molded polyethylene seat fits any type bowl and is easily cleaned. Contour seat provides a wider seating area that fits most standard and elongated toilets. Skid-resistant rubber pads. Requires no installation. Simply locks in place. No tools required. love the elevated toilet seat. it is just the right highth for me to sit down and be able to get up with no effort. if rocks when you clean yourself and i have a ? about there being a larger size. anyone needing just a few more inches will find this a great comfort and value. Grips were already coming when arrived. Was shipped in flimsy product box so now all my neighbors know I need a elevated toilet seat. Top of box was almost torn all the way off and seat has scuff marks on it like it had fallen out of box and put back in. This toilet seat has been a great help. Elevated toilet seat works very well.Only problem I encountered was seat slipping.Seems it needs either more of the rubber grippers or another way to secure seat. I really liked this product and found it to be a big help. This elevated toilet seat was a big help this weekend. 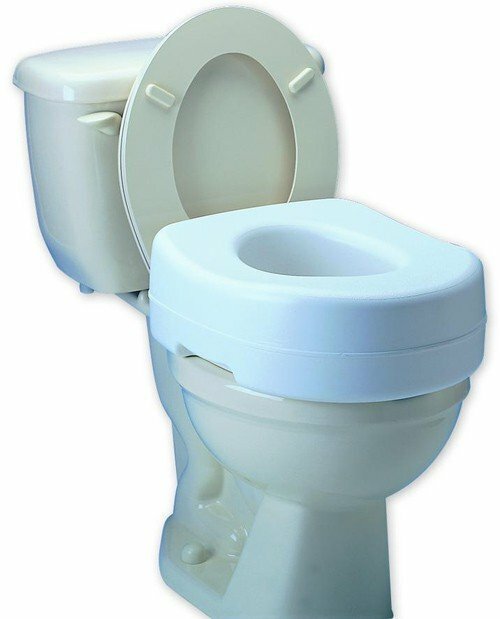 It was used in a hotel and a home with low toilets. It sat firmly on both toilets and added the extra 5". I had a total knee replacement 5 weeks ago and it really helped with getting up and down on the toilet. The grips really haeld the seat in one place. Well worth the money. I had to have a serious back surgery and it made me have a severe pain all over my back. I couldn't bend it even just a little. Mom installed it for me and it fitted both of toilets in my house so I could use either of them. It's sturdy and firm. Some people might have no idea how this simple thing could help you, but for others, it can be a great pain reliever.